Ideal for switching coaxial-type connections; such as video or network cables. All connectors are BNC type female. Type: 2-way AB manual switch. Ideal for switching coaxial-type connections; such as video or network cables. All connectors are BNC type female. Type: 4-way ABCD manual switch. Ideal for sharing serial peripherals. All connectors are DB9 type female. Type: 2-way DB9 AB manual switch. Wired straight-thru in a pin-to-pin configuration. Push button switch. No Power Required. Anti-skid feet. Ideal for sharing serial perpherials or CGA/EGA monitors. All connectors are DB9 type female. Type: 4-way DB9 EGA ABCD manual switch. Wired straight-thru in a pin-to-pin configuration. Heavy-duty; easy-to-turn rotary switch. No Power Required. Anti-skid feet. Ideal for sharing serial perpherials or CGA/EGA monitors. Ports:1x DB9 Female; 4x DB9 Male. Type: 4-way DB9 EGA ABCD manual switch. Wired straight-thru in a pin-to-pin configuration. Heavy-duty; easy-to-turn rotary switch. No Power Required. Anti-skid feet. Ideal for sharing game port / MIDI peripherals or Apple monitors. Ports:3 x DB15 Female. Type: 2-way DB15 AB manual switch. Wired straight-thru in a pin-to-pin configuration. Heavy-duty; easy-to-turn rotary switch. No Power Required. Anti-skid feet. Ideal for sharing game port / MIDI peripherals or Apple monitors. Ports:5 x DB15 Female. Type: 4-way DB15 ABCD manual switch. Wired straight-thru in a pin-to-pin configuration. Heavy-duty; easy-to-turn rotary switch. No Power Required. Anti-skid feet. Ideal for sharing parallel Printer Scanner; Zip Drive; or serial perpherials. All connectors are DB25 type female. Type: 2-way DB25 AB manual switch. Wired straight-thru in a pin-to-pin configuration. Heavy-duty; easy-to-turn rotary switch. No Power Required. Anti-skid feet. Ideal for sharing parallel Printer Scanner; Zip Drive; or serial perpherials. All connectors are DB25 type female. Type: 4-way DB25 ABCD manual switch. Wired straight-thru in a pin-to-pin configuration. Heavy-duty; easy-to-turn rotary switch. No Power Required. Anti-skid feet. Ideal for sharing VGA monitors. All connectors are HD15 VGA Female. Type: 2-way HD15 VGA manual switch. Wired straight-thru in a pin-to-pin configuration. Heavy-duty; easy-to-turn rotary switch. No Power Required. Anti-skid feet. Ideal for sharing VGA monitors. All connectors are HD15 VGA Female. Type: 4-way HD15 VGA ABCD manual switch. Wired straight-thru in a pin-to-pin configuration. Heavy-duty; easy-to-turn rotary switch. 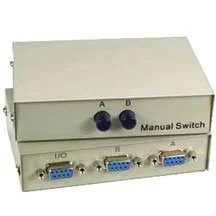 Manual KVM switches available at Sf Cable allow for switching of devices without physically unplugging and plugging different devices. You can now order them at the comfort of your homes and we will get them delivered at your doorsteps. You can choose from 2 way VGA HD15 manual switch, 4 way VGA electrical push button switch, 2 way BNC Female AB switch box, 4-way BNC Female ABCD switch box, 2-way CN36 Female AB manual switch box, 2-way and 4-way DB9 Female AB serial or EGA monitor switch box, 2-way and 4-way DB9 Male AB data switch box, Female AB joystick switch box, Female AB straight thru switch box, VGA monitor switch, MiniDin6 to MiniDin6 AB switch box, ABCD switch box, and many other products. SF Cable brings all the products to you directly from ISO 9001 - 2000 registered manufacturers to ensure that you get the highest quality of products at most competitive prices.